Minister's wives have a big role to play in assisting their husbands spiritually, physically and in their congregations. As the co-workers with their husbands they need to be reminded of their role for the spiritual growth of Christians in their congregations. Therefore the Synod believes in sending them for retreats from time to time to remind them of and strengthen their skills. CCAP Blantyre Synod has more than two hundred Ministers Wives from all the eighteen Presbyteries. Therefore, we have planned that that will go for retreat in three phases. Some will go to Chilema Lay Training Centre, others Chigodi Women Training centre and others to Likhubula Youth Training Centre. This is in order to reduce traveling expenses since the Synod covers the whole Southern Region of Malawi. In these three places, the retreats will be done for three days in those centers. Attending this retreat will not only remind and strengthen them but also help them to be able to teach Mvano members in their congregations since they have a leading role as Spiritual Mothers. The total required to be raised is MK1,078,600 which covers transport costs (MK 230,000), Meals (MK 420,000), accommodation (MK 300,000), stationaries (MK 78,600) and medical aid (20,000) and the rest is for contingency (MK 30,000). If you can help or want to get involved please contact Rev. Kapinda or the Deputy GS. The Coordinator of Synod Women’s desk who shall be Secretary of the committee. The current coordinator (pictured on the right) is Rev. A. Kapinda. The coordinator of the Synod Evangelism and Training Committee. Three persons chosen by the Synod for their special skills and expertise in women’s work in the church, being church elders. The Director of Chigodi Women’s Training Centre. The Director of Synod Youth Department. Three young girls who are Congregation Youth Association Executive members and as nominated by the Synod Youth Committee. To unite the women of the church in the dedication or their love for Jesus Christ and His service, in the home, the community and the church. To coordinate women’s charity work in communities. To share in the mission of the church at home and overseas through thought, prayer and financial and material support. To receive reports from Presbytery full time workers on the state of women’s work in the church. Coordinate young boys & girls counseling to avoid boys and girls going astray. To coordinate family counseling training sessions and ensure the maintenance of the sanctity of marriage. Ensure standardisation of practice and procedure in all congregations women’s activities. To coordinate the prayers of the Women’s World Day of Prayers at Synod level. 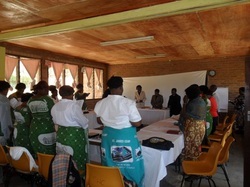 To coordinate AIDS activities and programmes among women in the church.